BlasTwit can be set up as a proxy to tweet using your own App. This is an advanced feature that requires that you become familiar with Twitter's App Management site. (NOTE: Credentials are encrypted in BlasTwit and stored separately from our main application site following strict security practices. However, it is a best practice to frequently refresh your tokens and deactivate any time you suspect unauthorized use of your credentials. 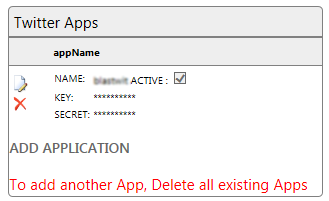 To add your app enter the AppName and AppKey and Secret in their respective boxes and click save (FIG 13). Please ensure the "ACTIVE" flag is checked. Once saved, the tokens will not be visible (FIG 13-1), nor can they be edited. 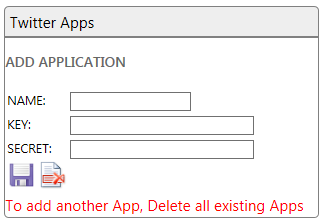 To re-enter the tokens, you will need to delete the App and re-enter it. 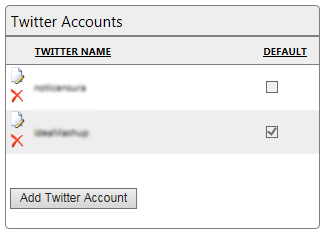 Once the app is entered, you will need to retrieve or refresh your Twitter account tokens (FIG 13-2). You can read more on linking your Twitter account here.